Increasingly potent compounds used in pharmaceutical research and manufacture pose a health risk to workers. 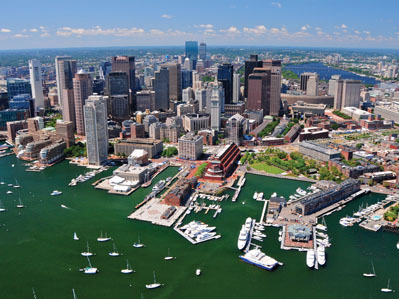 Reducing and, where possible, eliminating this risk is the role of containment systems. Containment involves isolating the product and process rather than the operator, thus avoiding the need for excessive levels of personal protection equipment. Other benefits of containment include prevention of cross contamination and dust hazard, reducing the need for manual cleaning and the creation of a more ergonomic and efficient working environment in line with FDA regulation and Good Manufacturing Practice (GMP) design. Containment solutions typically include isolators, extraction booths and split butterfly valves. 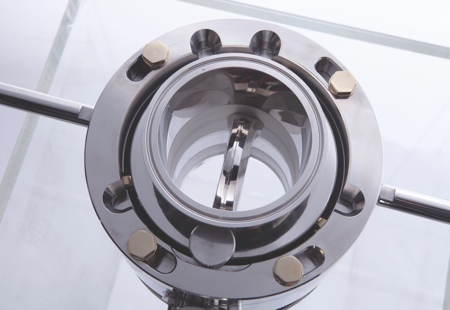 ChargePoint Technology is a leading supplier of split butterfly valves to the pharmaceutical industry. 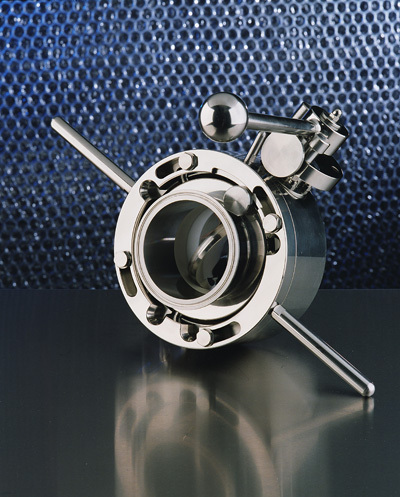 Its valves are used for a variety of powder handling containment applications where operator exposure limits down to nanogram levels are required. The valve has two critical sealing elements: metal-to-metal and metal-to-elastomer. The ChargePoint valve coupling comprises Active and Passive halves, each with an external metal disc interface (see Figure 1). When the two halves of the valve are docked together, the coupling becomes a single unit and the metal discs come together to form a single disc. The quality of this metal disc seal is one of the key design features that contributes to the containment performance of a split valve. When docked the single metal disc is released and powder flows into the reactor vessel. The precision of the metal disc seal is such that it prevents product from entering the metal-to-metal disc interface. When the coupling is undocked after product transfer the two external facing discs are clean, and no product is released into the operating environment. A metal-to-metal disc seal relies solely on the precision of the two disc faces to create an effective seal; there are no elastomer seals to compensate for any inaccuracies in the sealing faces. The advantage of this approach is its simplicity, minimisation of components and reduced risk of breech of containment due to damage and wear of elastomeric parts. 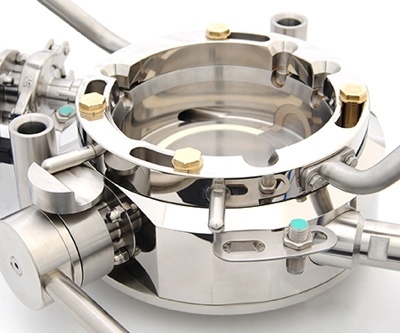 Elastomer seals are used, however, as a ‘seat’ within each half of the valve, providing a containment seal between the Active and Passive bodies when connected together, and also a seal for the Active and Passive metal discs in their respective halves of the valve. The tolerance of the elastomer seat component is an important design feature. An under-tolerance seat will not allow an effective containment seal, while an over-tolerance seat will prove difficult to operate due to friction between the seat and metal disc. This is particularly evident on larger valve sizes where the surface area of disc in contact with the seat is greater, and friction is therefore increased proportionally. 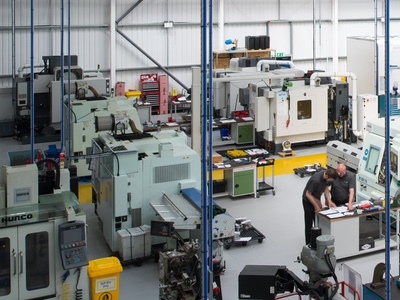 ChargePoint Technology has worked with seals producer Precision Polymer Engineering (PPE) on perfecting the elastomer seat seal. The seals are precision moulded and machined to meet the high tolerances needed for smooth manual and automated operation of the valve. ‘PPE's precision moulding allows for minimal wear on the seat due to friction, thus increasing the lifetime of the seat and reducing the risk of loss of containment or contamination of the product,’ says Eccles. For the ChargePoint valve range 50–300mm, PPE supplies three grades of seal: EPDM (ethylene propylene diene M-class rubber), V70SW FKM (fluoroelastomer), and Perlast G74S (perfluoroelastomer). Each elastomer is compliant with the requirements of the Food and Drug Administration regulatory standard 21CFR 177.2600 for ‘rubber articles intended for repeated use’ in food manufacture and US Pharmacoepia - Class VI (USP Class VI). In addition to the seat seals, each ChargePoint valve uses a total of four elastomer seals. ChargePoint Technology has also designed a split butterfly valve for use under vacuum or pressure conditions, typically rated up to 6Bar and full vacuum. The ChargePoint solution does not rely on a thick disc profile, which can impede powder flow, to achieve a pressure rating but utilises an O-ring seal between the Active and a Pressure Rated Plug. As a result, the valve can also be fitted with a Pressure Rated Passive unit and opened up enabling product transfer under pressure or full vacuum. 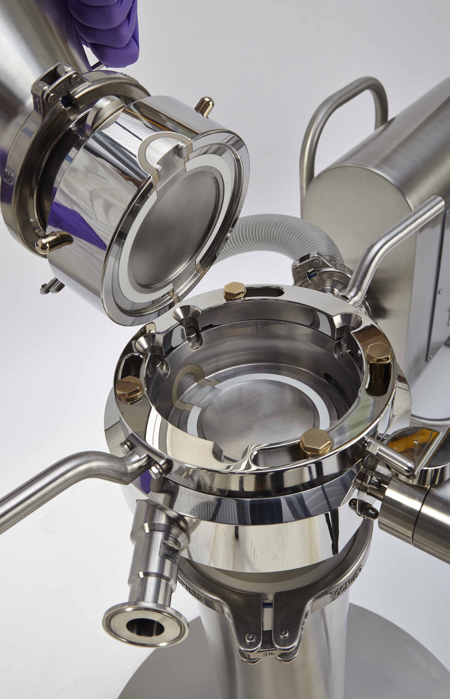 ChargePoint valves are routinely subject to a wide variety of chemicals and solvents during pharmaceutical production, followed by aggressive cleaning agents including high temperature steam. 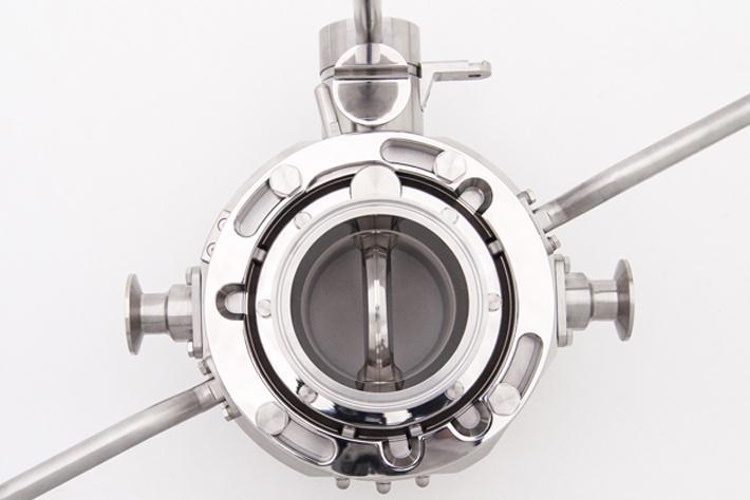 For clean-in-place (CIP) the valve uses a device that mimics the Passive body by docking into the Active to provide cleaning of the valve sealing faces and in some cases the container, vessel or IBC it is connected to. Once in place, a water-tight containment seal is ensured by an O-ring between the Active and CIP device. For a new production campaign, the split butterfly valve is dismantled for thorough cleaning of the individual components. The use of minimal parts makes the task of assembly or dismantling for cleaning much easier, thus reducing process downtime. 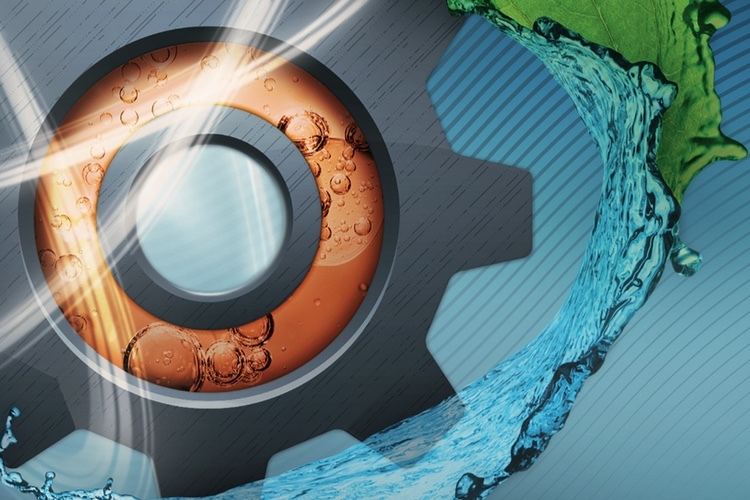 ChargePoint Technology encourages valve users to inspect the seals visually as part of a maintenance programme to ensure longevity of operation. For many FKM and perfluoroelastomer (FFKM) seals it is the cleaning agents that take the greatest toll on their operational life. In collaboration with ChargePoint Technology, PPE has developed a customised FKM grade that improves the seal’s resistance to high temperature steam clean-in-place. The V70SW grade FKM fills the gap between EPDM and FFKM performance. EPDM lacks adequate chemical resistance to high temperature oils and solvents but is resistant to water. FFKMs, at the other end of the elastomer spectrum, are resistant to oil and solvents and steam, but cost-prohibitive for many applic-ations. The FKM grade sits between EPDM and FFKM, combining excellent chemical resistance and mechanical properties with steam resistance and temperature stability up to 200˚C. 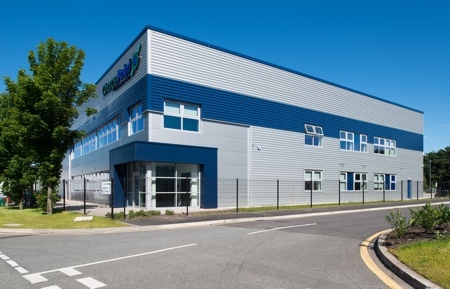 Eccles welcomes the collaboration with PPE in the on-going development of ChargePoint. ‘We see PPE as a technology partner where they understand our business and are able to respond quickly to short lead times. 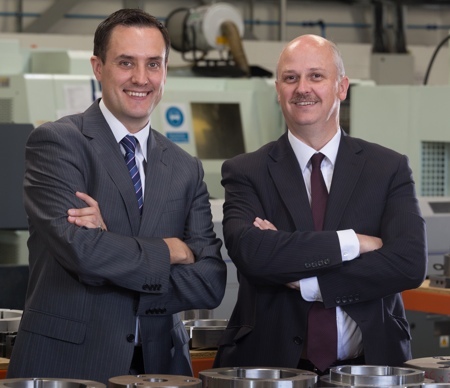 For example, we’ve involved them in new product developments such as the ChargePoint DL 200mm, 250mm and 300mm valves for bulk materials where a much larger seat seal is needed,’ he says. 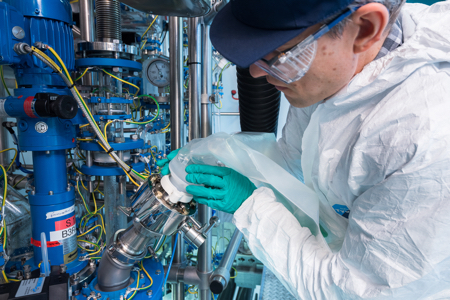 ‘By tapping into PPE's in-depth knowledge of elastomers, and precision manufacture, we are able stay one step ahead of the containment challenges – both technical and financial – facing our customers.